Our next generation health assessment uses graphics, pictures and other interactive elements to help you complete your own personal assessment. You’ll receive your results and recommendations immediately and you can return to your assessment at any time to modify or update it with new information – just hit the RETAKE button. You’ll earn 100 points per year when you complete the Compass health assessment. Go to mymedica.com and click on the Health & Wellness tab. 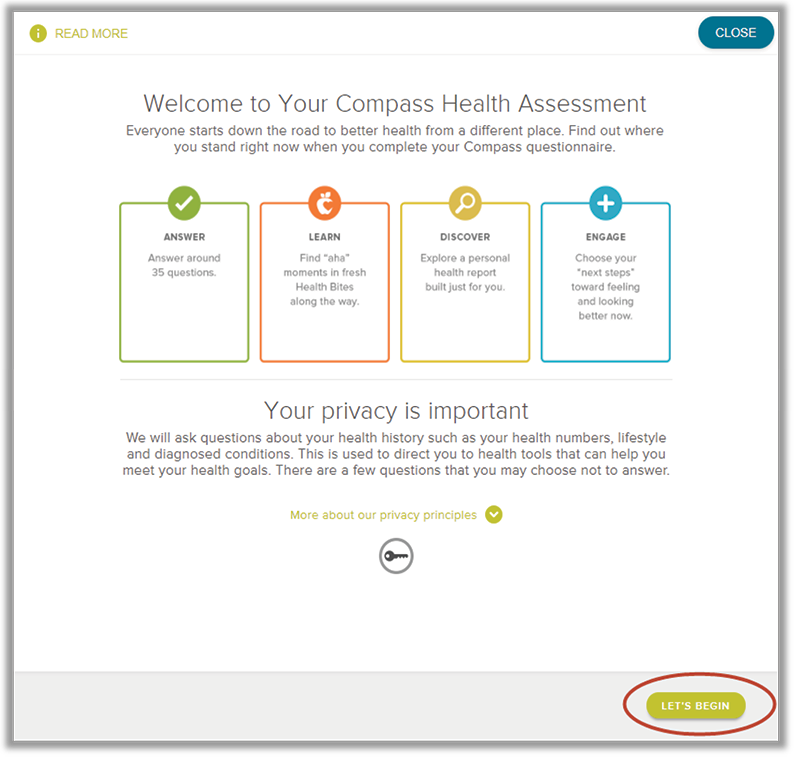 Scroll down to the Start your Compass Health Assessment section on the homepage and click the LET’S DO THIS button. If you’ve taken the health assessment before, the site may show your results from the previous plan year. Click the RETAKE button at the top of the page to take the assessment again (see example below) in order to earn a $20 gift card for this activity and 100 points towards the well-being program. If this is your first time taking the Health Assessment, just click the LET’S BEGIN button on the health assessment page to start. You will earn a $20 gift card and 100 points for completing this activity. Answer questions about your health, wellness and activity level. It will take about 15-20 minutes to complete. You don’t have to complete it in one sitting. Click SAVE FOR LATER and pick up where you left off at a later date. 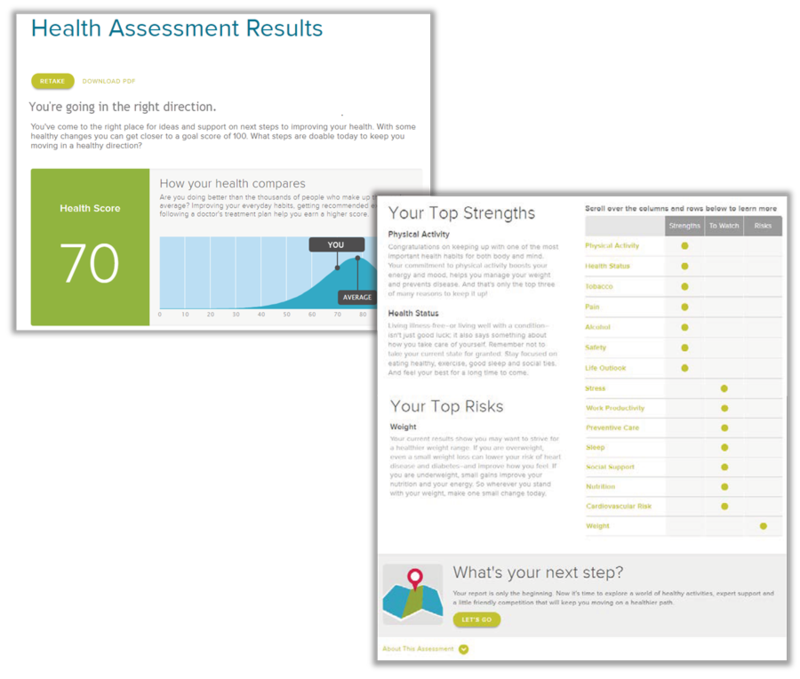 Review the Health Assessment Results page to see your top health & wellness strengths, risks and how you compare to others. Go to your member website, mymedica.com, and click on the Health & Wellness tab to get started. Rewards for participating in a wellness program are available to all eligible employees. If you think you might be unable to meet a standard for a reward under this wellness program, you may qualify for an opportunity to earn the same reward by different means. Submit a question to medica.com/healthandwellnessquestions or call Medica Customer Service at 952-945-8000 for information on available reasonable alternative standards and we will work with you (and, if you wish your physician) to find a wellness activity with the same reward that is right for you in light of your health status.